If there was a common currency* used in Middle Earth, Bilbo Baggins and Gandalf the Grey would’ve totally been famous enough to have their faces grace coins all over the land. But back here on regular old boring Earth, they’re important enough in New Zealand to be featured on actual legal tender, as well as a new set of stamps to commemorate the upcoming The Hobbit: An Unexpected Journey. Even if the silver and gold pieces could be used to purchase stamps, it’s doubtful that the normal consumer will part with the special coins, as they’re worth more as collectible items than as the New Zealand dollar amount pressed on them. 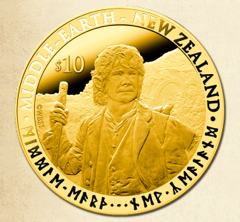 Along with Bilbo and Gandalf, the faces of dwarf king Thorin Oakenshield and three other dwarves, wizard Radagast the Brown, Lord of Rivendell Elrond and Gollum will be featured on the collectible coins (along with Elvish script on some of them), which range from a NZ$1 coin retailing for NZ$29.90 to a NZ$10 pure gold coin that sells for NZ$3,695. The New Zealand Post is in charge of minting the coins, and is also releasing six stamps with characters from the film — Gandalf, Bilbo, Elrond, Radagast, Thorin Oakenshield and Gollum. The coins and stamps will go on sale Nov. 1, in plenty of time for the holiday season and the Dec. 14 release of the Hobbit movie. Pardon me while I dust off a shelf that will be just perfect for my future Hobbit coin display. *The Internet says Middle Earth-dwellers didn’t much use coins, at least not that J.R.R. Tolkien mentioned. Gondor had a silver coin called tharni, apparently. Feel free to weigh in via tips@consumerist.com with your superior knowledge.